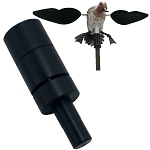 Responding to the many requests from hunters, MOJO has developed a quality extension pole for use (1) in deeper water or (2) to place your MOJO Decoy higher in the air. Comes in 3 sections of approximately 4-foot that allow pole heights of 4’, 8’ or 12’. Connects easily and conveniently with included quick clip pins. Includes top with cam lock to hold and secure the MOJO patented breast peg. Useful for placing multiple MOJO’s at different heights to give them a different and realistic look or, allows you to set your MOJO in up to 10 feet of water.